It started with a crock, as so many things do. 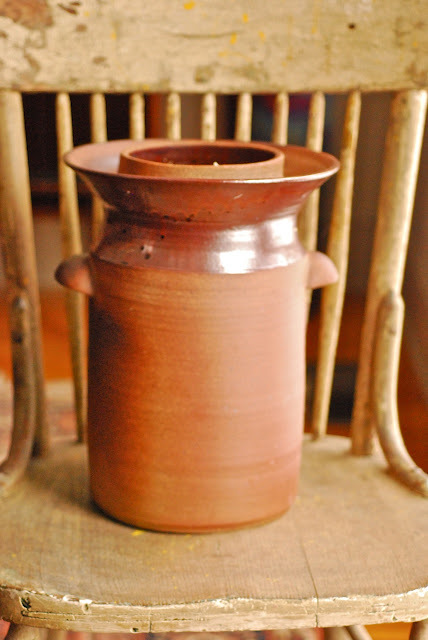 In this case, a beautiful wood-fired stoneware sauerkraut crock made by local potter Maya Zelkin. 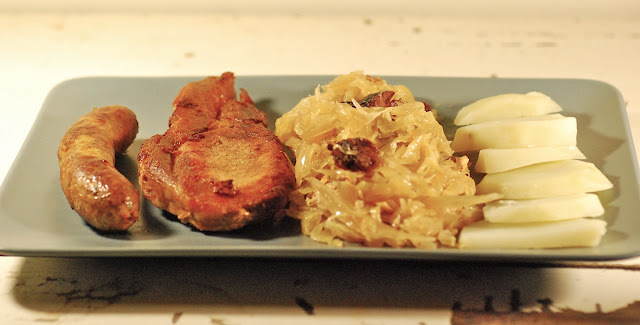 As I stood in Maya's chilly studio last fall (she lives off the grid), her son, who is very young, offered me a bite of raw sauerkraut and a glass of juice. I was charmed, and I loved the sauerkraut, which was crunchy, light, fresh. Then Maya showed me the Crock. To justify the purchase of this object, I promised myself to make sauerkraut according to Maya's directions: Tamp, Tamp, Tamp the cabbage, and keep on Tamping. Put on a little salt. 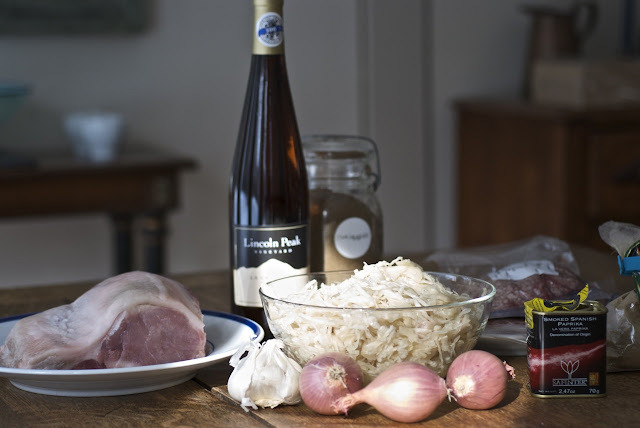 And in fact, that is basically the recipe for sauerkraut. Salt - 3 TB. per 5 lbs of cabbage. Trim out the stem of the cabbage, and remove dried outside leaves if necessary. Weigh the cabbage, and measure the correct amount of salt into a small dish. Shred cabbage in food processor or by hand. Pack the cabbage into the crock, tamping it down hard as you go. The tamping bruises the cabbage and helps it release water. 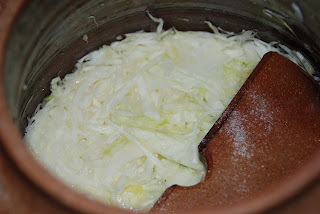 Put on a bit of the premeasured salt on each layer of cabbage. Place a plate or another nonreactive weight on the top layer, cover the crock and put in the cellar or in another cave-temp spot. Don't leave it in a warm room; this can have the effect of speeding up the fermentation, and not in a good way. Check it in a day or two; there should be liquid covering the weight. If not, add salted water to cover. The kraut will be ready in 4 or 5 weeks. When it's ready, you can refrigerate it, and it will continue to develop. Check the kraut periodically, adding more water if needed. After four or five weeks, it will look, smell, and taste like sauerkraut. Raw, it is interesting and reportedly very healthy. 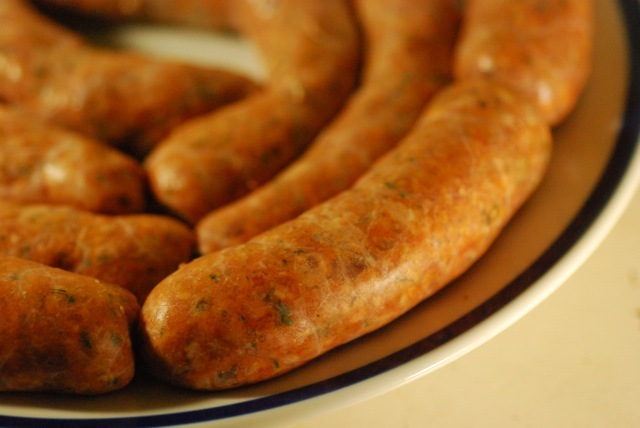 Cooked, it becomes silken and more delicious, particularly with the addition of a Reisling-type wine, smoky Vermont bacon, garnished with chops and Sambuca-laced Merguez sausages. 1 1/2 c. LaCrescent from Lincoln Peak vineyard. Or, if you can't find this terrific Vermont wine, use a good Reisling. 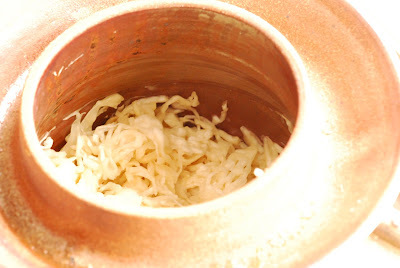 If the sauerkraut is dry, add liquid until just covered. Put on lid and braise for a total of 2.5 hours. Brown five boneless loin chops in olive oil; season with salt and pepper. Trim fat from the cooked chops, then add to the braising dish. Lay them on the surface of the kraut, press in lightly. 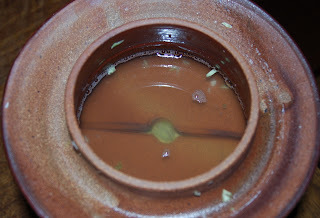 The chops should rest on the surface, rather than being submerged. 1. Saute onion and garlic in the olive oil. 2. 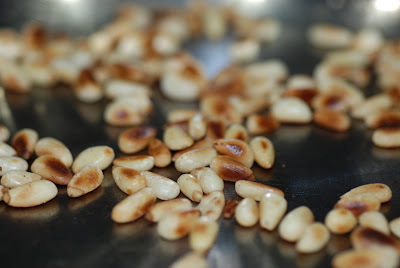 Toast the pine nuts: place in a stainless frying pan, directly on heat. Stir with wooden spoon until browned. Set aside. 3. Stir together all ingredients in a non-reactive bowl. Grind through the coarse blade of a meat grinder. Cook a small sample, taste, and adjust seasoning. 4. Stuff sausages into casings using the process described here, and form into links. 5. 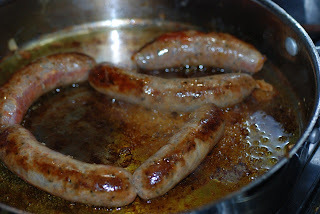 Saute sausages in olive oil until well-browned. 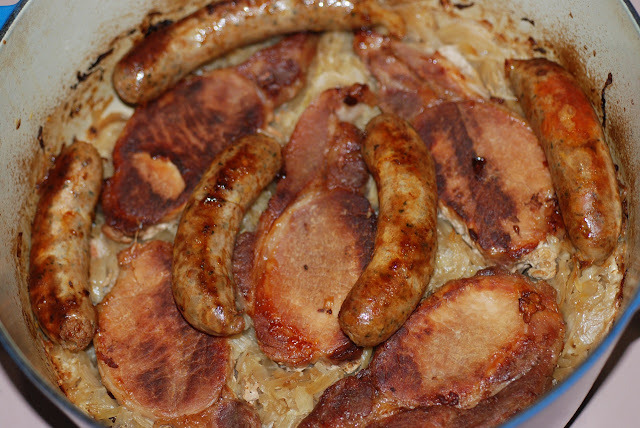 Place sausages on the finished Choucroute and serve! Plate this with hot boiled potatoes on the side. This looks and sounds soooo good. 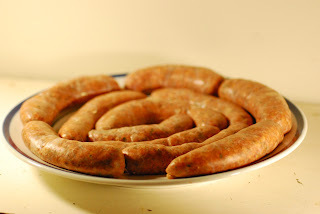 I love sauerkraut and there is nothing like a good homemade sausage.